Stop It Goaltending provides summer training opportunities for goalies of all levels and abilities. We offer eight-week training programs, a week-long prospects event, full day training weeks, half-day training weeks, as well as private lessons. The eight-week programs consist of the PGD and DNHL programs. 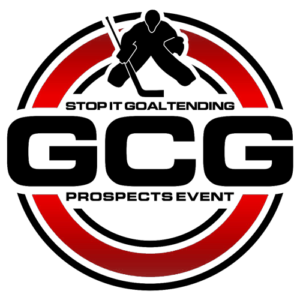 We also offer the GCG Prospects Event, which is an elite camp for Pro, College, Junior and High School goalies. For a more personal one-week training experience, we also offer the Complete Goaltender Weeks at Merrimack College. Half day training weeks come in the form of the AAA Youth, Bantam and High School four day programs at all of our locations as well as the half day Total Skills weeks. The GCG Prospects Event is held at the New England Sports Center in Marlboro, MA. Eight-week programs, four-day programs, and private lessons are held at all of our locations which include North Andover, Woburn, Foxboro, Middleton, Marlboro and Springfield, Massachusetts. For more information please see program description below or call (781) 376-9000. 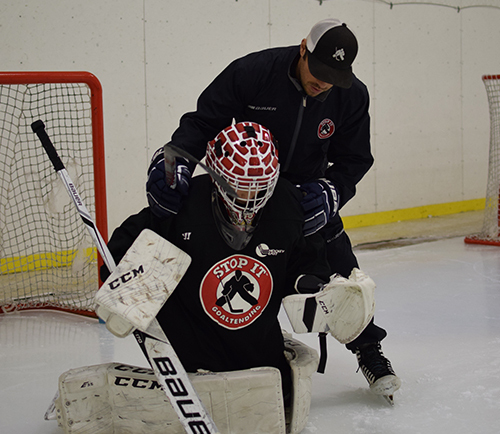 The Stop It Goaltending Pro Goalie Development Program (PGD) is specifically designed for motivated and talented goalies who are able to train throughout the Summer with their peers. This program is run on full ice sheets and goalies receive high-level instruction. The PGD program consists of two eighty-minute on-ice sessions weekly for eight weeks. On-ice training consists of a combination of skating drills, techniques and strategies, puck handling and competition. A video is recorded and displayed on the ice for immediate feedback. There is no off-ice component to this program. If you are interested in, or if you have any questions about our PGD Pro Goalie Development Program, please contact the Stop It Goaltending office at (781) 376-9001. Two demanding 80 minute weekly on-ice sessions on full ice sheets over eight weeks. 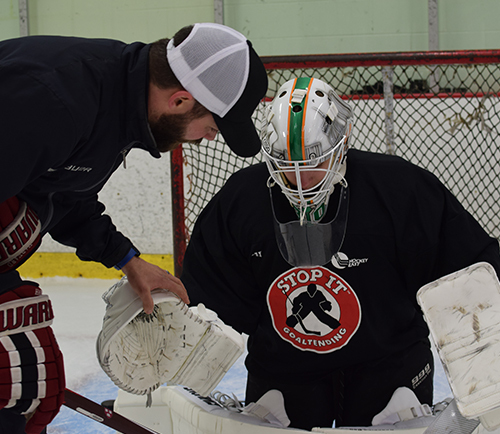 The Stop It Goaltending DNHL Program (DNHL) is specifically designed for motivated goaltenders providing an environment where goalies are able to train throughout the Summer with their peers while receiving high-level instruction from professional coaches. The DNHL consists of two eighty-minute on-ice sessions weekly for eight weeks. Groups are either Mondays and Wednesdays or Tuesdays and Thursdays. The DNHL program is run at SIG development centers. On-ice training consists of a combination of skating drills, techniques and strategies, puck handling and competition. A video is recorded and displayed on the ice for immediate feedback. There is no off-ice component to this program. If you are interested in, or if you have any questions about our DNHL Program, please contact the Stop It Goaltending office at (781) 376-9001. Two demanding 80 minute weekly on-ice sessions at goaltending specific development centers over eight weeks. 4 Day Unlimited Pass (High School) $795: The cost of the 4 Day Unlimited PAD Pass for High School Athletes is $795 which includes 8 weeks of training beginning June 17th and ending August 15th. Participants have full access for four days a week, Mondays through Thursdays. 2 Day Unlimited Pass (High School) $595: The cost of the 2 Day Unlimited PAD Pass for High School Athletes is $595 which includes 8 weeks of training beginning June 17th and ending August 15th. Participants have full access for two days a week, Mondays through Thursdays. 4 Day Unlimited Pass (College/Open Gym) $495: The cost of the 4 Day Unlimited PAD Pass for College Athletes is $495 which includes 8 weeks of training beginning June 17th and ending August 15th. Participants have full access for four days a week, Mondays through Thursdays. Please note most college athletes are required to complete their schools summer strength and conditioning program. Along with yoga and vision training, this option permits access to UFit and equipment to college athletes but not a program like the High School athletes participate in. 2 Day Unlimited Pass (College/Open Gym) $350: The cost of the 2 Day Unlimited PAD Pass for College Athletes is $350 which includes 8 weeks of training beginning June 17th and ending August 15th. Participants have full access for two days a week, Mondays through Thursdays. Please note most college athletes are required to complete their schools summer strength and conditioning program. Along with yoga and vision training, this option permits access to UFit and equipment to college athletes but not a program like the High School athletes participate in. Only 50 Unlimited PAD passes are available and are on a first come, first serve basis. ** There will be a break week July 15th to 21st where no training will be held. The PAD, located in Woburn, MA is excited to offer an Unlimited PAD Pass for dedicated athletes this summer which includes unlimited access to Unleashed (Ufit) athletic performance strength and conditioning training, Eye on Performance vision training and The Athletes Yoga training. The Stop It Goaltending AAA Training Weeks are specifically designed for youth hockey goaltenders. This program runs Monday through Thursday and features 8 hours of on-ice development, 2.5 hours of video/theory and 6 hours of off-ice training. On-ice training consists of a combination of skating drills, techniques and strategies, puck handling and competition. The off-ice workouts are a combination of speed, quickness, and agility training as well as video classroom sessions and theory. Stop it Goaltending AAA weeks are held in our development centers and are run Mondays through Thursdays. If you are interested in, or if you have any questions about AAA Training Weeks, please contact the Stop It Goaltending office at (781) 376-9000. Experienced goalies challenged with progressive techniques and drills plus off-ice training. 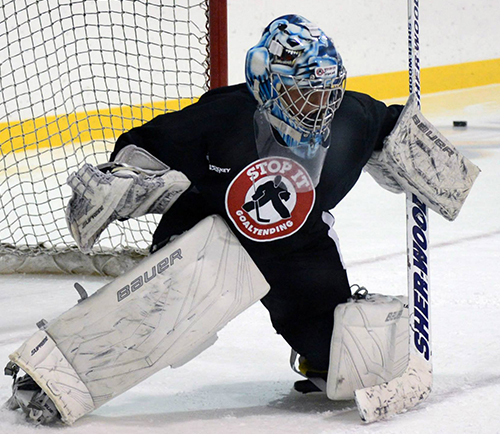 The Stop It Goaltending AAA Training Weeks are specifically designed for Bantam goaltenders. This program runs Monday through Thursday and features 8 hours of on-ice development, 2.5 hours of video/theory and 6 hours of off-ice training. Stop it Goaltending AAA weeks are held in our development centers and are run Monday through Thursdays. If you are interested in, or if you have any questions about AAA Training Weeks, please contact the Stop It Goaltending office at (781) 376-9000. The Stop It Goaltending AAA Training Weeks are specifically designed for High School/Prep/Midget goaltenders. This program runs Monday through Thursday and features 8 hours of on-ice development, 2.5 hours of video/theory and 6 hours of off-ice training. Progressive techniques and drills on-ice, plus speed, quickness, agility, strength and conditioning off-ice. The Stop It Goaltending Total Skills Training Weeks are specifically designed for Mite, Squirt and Peewee A, B and C goaltenders. This program runs Monday through Thursday and features 8 hours of on-ice instruction, 2.5 hours of video/theory and 6 hours of off-ice development. On-ice training consists of a combination of skating drills, techniques and strategies, puck handling and competition. The off-ice workouts are a combination of speed, quickness and agility training as well as video and theory. If you are interested in, or if you have any questions about Total Skills Training Weeks please contact the Stop It Goaltending office at (781) 376-9000. The Stop It Goaltending GCG Prospects Event is a world class week of training that features leading NHL and NCAA goalie coaches and is for elite goalies from across the US, Canada, and Europe. The event is held at The New England Sports Center in Marlboro, Massachusetts. It is specifically designed for elite Pro, College, Junior, High School, Prep, Midget and Bantam goalies and over the last 18 years has helped produce over 20 NHL draft picks. 14 GCG goalies have played in the NHL and countless other in the minors and college. There are also three daily presentations specifically for goalie parents looking for ways to help their goalies through their careers. Details: This Monday through Thursday event features 12 hours of on-ice instruction for the 05 through 02 groups and 8 hours of on-ice instruction for our junior, college and pro groups. There are daily lectures from current NHL goalie and NHL goalie coaches as well as off-ice training by Maria Mountain and Yoga with Kim Johnson. 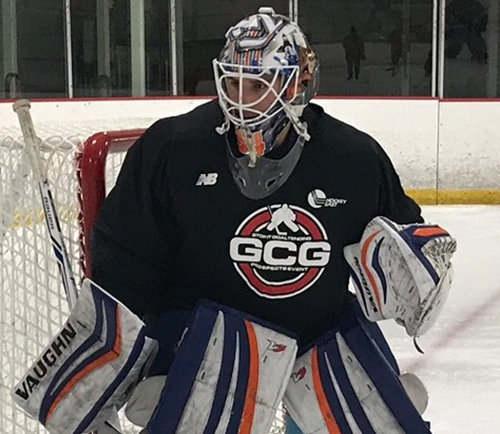 At the GCG Prospects Event, goalies will receive instruction from leading professional and collegiate goalie coaches representing leagues such as the NHL, AHL, Hockey East, Big Ten, ECAC, and Atlantic Hockey. There are two on-ice sessions each day, a power skating/puckhandling session every morning and a two-hour full drill session each afternoon. 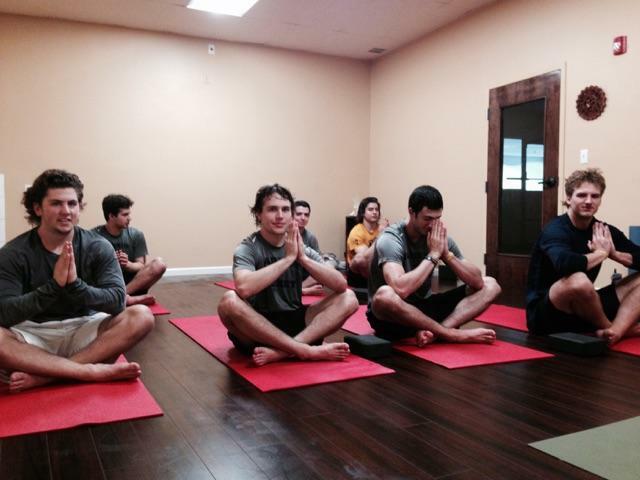 Each day features lectures from NHL goalies and goalie coaches, off-ice training as well as daily yoga practice. If you are interested in, or if you have any questions about our GCG Prospects Event please contact the Stop It Goaltending office at (781) 376-9001. Hotel: The host hotel for the GCG Prospects Event is the Embassy Suites in Marlboro, MA located just 4 miles from the New England Sports Center. Goalies staying at the hotel must reserve a room on their own. We have set up a platform for goalies to connect with other goalie wishing to split a room. Please note that hotel fees are in addition to the GCG Prospects Event registration fee. All the rooms are suites and come with a full hot breakfast. The GCG coaching staff will be staying at the hotel as well. You may reserve a king ($169.95) or a Double ($199.95). Please call (508) 485-5900 and request the Stop It Goaltending Prospects Event group rate to book your room at the Embassy Suites or book online using this link. The Stop It Goaltending GCG Prospects Event is a world class week of training that features leading NHL and NCAA goalie coaches and is for elite male and female goalies from across the US, Canada, and Europe. The Stop It Goaltending GCG Women’s Prospects Week is a four day training week held at the New England Sports Center, in Marlboro MA and is designed specifically for top U-16 to U-20 female goaltenders. 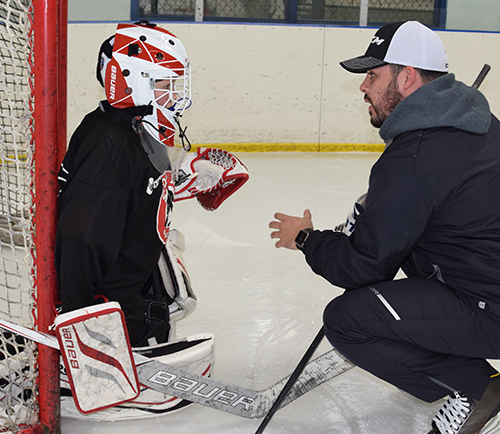 GCG and college coaches join Boston University goalie coach Amy Zappen in offering a week of on-ice instruction, off-ice training, and lectures. 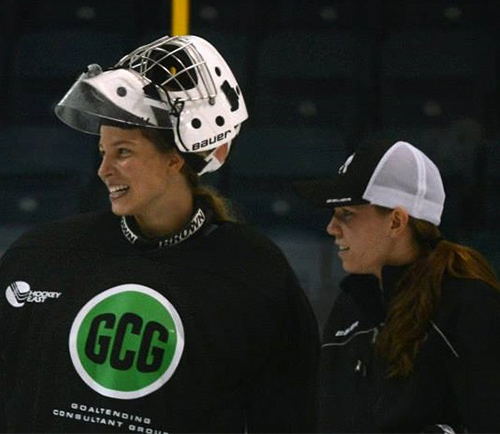 The Stop It Goaltending GCG Prospects Event for Women is held in conjunction with the GCG Men’s event and features both top NCAA and CIS Women’s and Men’s goalie coaches. Details: This Monday through Thursday event features 12 hours of on-ice instruction, daily lectures from current NHL goalie and NHL goalie coaches as well as off-ice training by Maria Mountain and Yoga with Kim Johnson. At the GCG Prospects Event, goalies will receive instruction from leading collegiate goalie coaches representing leagues such as Hockey East and the ECAC. There are two on-ice sessions each day, a power skating/puckhandling session every morning and a two-hour full drill session each afternoon. Each day features lectures from NHL goalies and goalie coaches, off-ice training as well as daily yoga practice. If you are interested in, or if you have any questions about our GCG Prospects Event please contact Amy Zappen at amy@stopitgoaltending.com or call (800) 801-1968 ext 2. 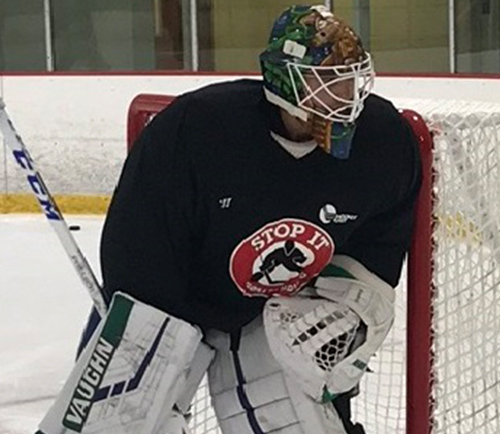 The Stop It Goaltending GCG Women’s Prospects Week is a four day training week ran by Boston University Goalie Coach, Amy Zappen, and held at the New England Sports Center, in Marlboro MA and is designed specifically for top U-16 to U-20 female goaltenders. The Stop It Goaltending Complete Goaltender Training Weeks are specifically designed for motivated goaltenders and held at Merrimack College in North Andover, Massachusetts. This is a very personalized week that only accepts four goalies and focuses on each individual goalies systems and strategies. The end goal is to leave the program with a detailed plan (SIG Personal Playbook) for all situations which will contribute to a goalies confidence and success between the pipes. The program runs Monday through Thursday and features 12 hours of on-ice and 12 hours of off-ice development. On-ice training consists of a combination of skating drills, techniques and strategies and puck handling. An extensive video is used during this week. The off-ice training is a combination of speed, quickness and agility training, strength and conditioning exercises and classroom sessions and theory. Lunch is provided each day and the Complete Goaltender Week does not include boarding at Merrimack College. If you are from outside the area we suggest the Holiday Inn Express located down the road from Merrimack College. Goalies in need of a room should call (978) 975-4050 and ask for the Stop It Goaltending/Merrimack College Rate. Rooms are limited so you are advised to call early. If you are interested in, or if you have any questions about our Complete Goaltender Training Week please contact the Stop It Goaltending office at (781) 376-9001. 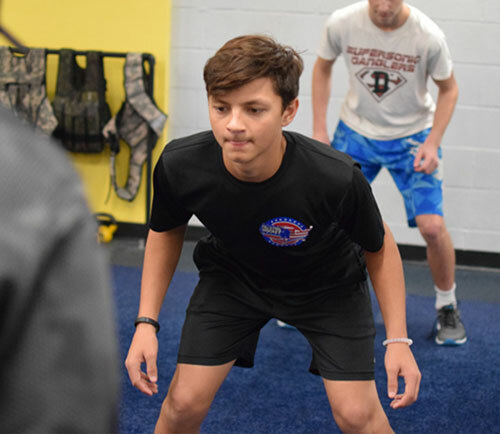 Two on-ice workouts daily, off-ice training, video and classroom sessions for goaltenders looking for a small group experience and intense system and strategy development. This summer Stop It Goaltending will be offering powerskating every Monday through Thursday morning at Merrimack College for high school and older goalies. Participating goalies can skate up to four days a week for 50 minutes from 8:30 to 9:20 AM for the cost of $199. Focus points will be edge control, explosiveness, efficiency, balance and “mogility” (the combination of goalie specific movement and agility). There will also be a fair amount of puckhandling in these seasons and the two skills go hand in hand. There are just 16 spots available. This summer Stop It Goaltending will be offering powerskating every Monday through Thursday morning at Merrimack College for high school and older goalies.